Here are some tips and important information to help you prepare and get ready for the event! Book transport services no later than five working days before your preferred unloading/loading dates. Everything you need for your participation at the event is possible to hire or buy from us at Stockholmsmässan. You’ll find everything from carpet tiles and furniture to plants, lighting and banners in our Event Services Catalogue. Place your order conveniently digitally. In order to get the best possible service and the lowest price on our products, we need your orders no later than September 6. If you place an order after the deadline has passed, you will be charged a 30 percent surcharge. The surcharge is 50 percent on orders placed on, or following, the official move in-date. This also applies to changes. Please cancel the partitions if you don’t need them, for example if you are constructing your own walls. If you cancel the partitions during moving-in there will be an additional charge according to our current price list. You may order different color to your carpet, this to an additional cost according to current price list. In our General rules and instructions you find information about stand construction, fire regulations (no candles), age limits during the installation and dismantling, transportation, storage and disposal. Basically everything that is required to create a safe and pleasant event. Please also note that safety shoes are required during move-in and move-out. Safety shoes can be bought at our Service Centers. Let us help you with the logistics! Our logistic department is ready to take care of your transportation needs, all you have to do is pack and mark your goods. We handle the transportation all the way from your door and back – and deliver on time. To ensure an attractive overall impression in the halls, everything above 2,5 m height will be reviewed. Ordinary business insurance does not cover exhibitions at events. Stockholmsmässan has developed the market's best and simplest exhibitor insurance in association with Länsförsäkringar SAK AB, to create a problem-free participation for you as an exhibitor. We offer everything from spotlights to more advanced light rigging. Please take a look in our Event Services Catalogue or contact Event Services for custom made solutions. 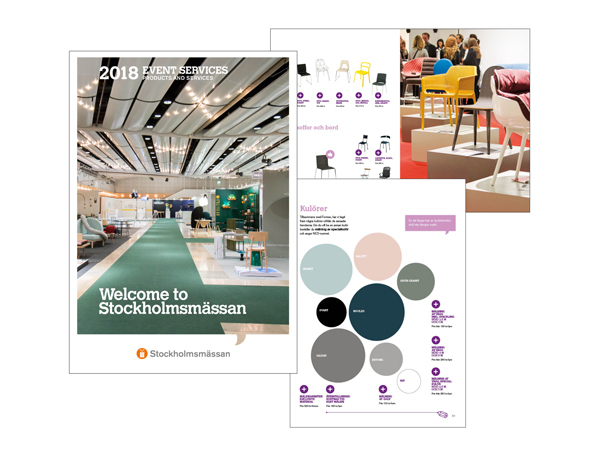 Stockholmsmässan's graphic department produces a variety of products, including posters, signs, roll-ups, drop-papers and give-aways as candy, clothes and other publicity articles. We are here to help you in a creative and cost-efficient way, regardless the size of the task. When you choose one of our packaged stand solutions we will help you design and build your stand. Your stand will be ready when you arrive and our builders will be standing by if you need help with anything. Mässrestauranger has the license to serve alcohol at Stockholmsmässan. This means that you as an exhibitor must go through Mässrestauranger if you want to offer beer, wine or liquor in your stand. All public areas at Stockholmsmässan have access to a free and open wireless network. We have received your email address from one or more of the following sources: a previous visit to Stockholmsmässan's events, registration for our newsletters, our own marketing research, lists from partners or Bisnode. We process your personal data in accordance with the General Data Protection Regulation. More information about our personal data processing can be found in our data protection policy.